[S45] Website FreeBMD (http://freebmd.rootsweb.com/) "Marriages Jun 1886 HIBBERT David Bolton 8c 520." [S45] Website FreeBMD (http://freebmd.rootsweb.com/) "Marriages Jun 1886 Gillibrand Jane Bolton 8c 520." [S49] UK National Census for 1881 Index, UK "RG11/3815 f83 p5." [S72] UK National Census for 1891 for UK, "RG12/3094 f21 p35 202." [S45] Website FreeBMD (http://freebmd.rootsweb.com/) "Marriages Sep 1882 Hibbert John Bolton 8c 408." [S49] UK National Census for 1881 Index, UK "RG11/3815 f30 p54." [S72] UK National Census for 1891 for UK, "RG12/3094 f6 p5 26." [S48] Online index to the UK National Census for 1901 for UK "RG13/3599 f166 p28 145." [S2] UK National Census for 1871 for UK, "RG10/3918 f101 p41 236." [S2] UK National Census for 1871 for UK, "RG10/3918 f100a p40 236." [S45] Website FreeBMD (http://freebmd.rootsweb.com/) "Marriages Sep 1882 Rostron Margaret Bolton 8c 408." [S704] UK National Census for 1901 for UK, "RG13/3599 f166a p28 145." [S45] Website FreeBMD (http://freebmd.rootsweb.com/) "Births Mar 1883 Hibbert Thomas Bolton 8c 322." [S45] Website FreeBMD (http://freebmd.rootsweb.com/) "Births Sep 1886 Hibbert Elizabeth Alice Bolton 8c 304." GRO Reference: 1886 S Quarter in BOLTON Volume 08C Page 304." GRO Reference: 1891 J Quarter in BOLTON Volume 08C Page 385." [S45] Website FreeBMD (http://freebmd.rootsweb.com/) "Births Dec 1897 Hibbert Jane Bolton 8c 351." [S45] Website FreeBMD (http://freebmd.rootsweb.com/) "Births Sep 1900 Hibbert Eli Bolton 8c 363." GRO Reference: 1900 S Quarter in BOLTON Volume 08C Page 363." [S47] UK National Census for 1861 for UK, "RG 9/2835 f90a p48 261." [S45] Website FreeBMD (http://freebmd.rootsweb.com/) "Deaths Dec 1890 Rostron Ann 63 Bolton 8c 225." [S45] Website FreeBMD (http://freebmd.rootsweb.com/) "Deaths Dec 1869 Rostron Henry 45 Bolton 8c 161." Register: Burials 1866 - 1870, Page 79, Entry 627." Source: FHL Film 1751723 Dates: 1839 - 1844. GRO Reference: 1843 J Quarter in STOCKPORT Volume 19 Page 245." [S294] Baptisms, St Mary, Stockport, 1840-1849 "p150/1197." [S294] Baptisms, St Mary, Stockport, 1840-1849 "p66/525." [S49] UK National Census for 1881 Index, UK "RG11/3771 f97 p8." [S45] Website FreeBMD (http://freebmd.rootsweb.com/) "Marriages Sep 1867 HIBBERT William Wigan 8c 23." [S45] Website FreeBMD (http://freebmd.rootsweb.com/) "Marriages Sep 1867 SPEAKMAN Nancy Wigan 8c 23." [S1051] Website Lancashire BMD (http://lancashirebmd.org.uk/) "Wigan: C15/3/42." [S601] UK National Census for 1881 for UK, "RG11/3771 f97a p8 36b." [S72] UK National Census for 1891 for UK, "RG12/3083 f48a p40 220." GRO Reference: 1890 D Quarter in BOLTON Volume 08C Page 227." Hibbert, David 01 March 1887 Unrecorded." Source: FHL Film 1538435 Dates: 1844 - 1855. [S45] Website FreeBMD (http://freebmd.rootsweb.com/) "Births Dec 1861 HIBBERT Ell_n Leigh 8c 166." GRO Reference: 1861 D Quarter in LEIGH Volume 08C Page 166." GRO Reference: 1862 S Quarter in LEIGH Volume 08C Page 83." GRO Reference: 1863 S Quarter in LEIGH 467 Volume 08C Page 159." [S45] Website FreeBMD (http://freebmd.rootsweb.com/) "Deaths Mar 1869 Hibbert Peter 5 Leigh 8c 161." 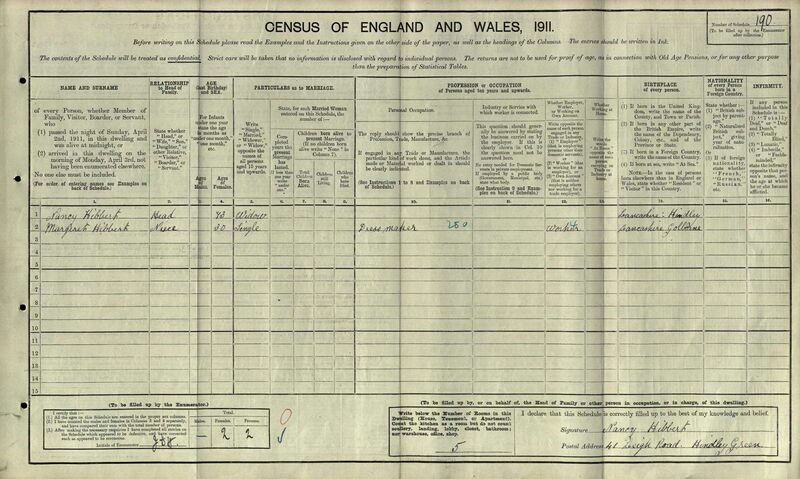 [S2260] UK National Census for 1911 for UK, "RG14PN23023 RG78PN1346 RD458 SD4 ED8 SN190." [S45] Website FreeBMD (http://freebmd.rootsweb.com/) "Deaths Jun 1911 Hibbert Nancy 73 Wigan 8c 46." [S1051] Website Lancashire BMD (http://lancashirebmd.org.uk/) "Wigan & Leigh : HNDL/42/355." [S45] Website FreeBMD (http://freebmd.rootsweb.com/) "Births Sep 1870 Hibbert George Edward Wigan 8c 78." [S1051] Website Lancashire BMD (http://lancashirebmd.org.uk/) "Wigan & Leigh : HNDL/46/321." [S45] Website FreeBMD (http://freebmd.rootsweb.com/) "Births Jun 1872 Hibbert John Thomas Wigan 8c 85." Source: FHL Film 1751718 Dates: 1819 - 1822. [S295] Baptisms, St Mary, Stockport, 1818-1821 "P93/741." [S9] BMD Transcript, St Michael & All Angels (Burtonwood), 1668-1837 "p55 Henry s. of William & Betty Johnson of Bold, farmer." [S9] BMD Transcript, St Michael & All Angels (Burtonwood), 1668-1837 "p47 Oct 5 1788 John s. of William & Betty Johnson of Bold, farmer." [S9] BMD Transcript, St Michael & All Angels (Burtonwood), 1668-1837 "p50 Apr 21 1793 William s. of William & Betty Johnson of Bold, farmer." [S9] BMD Transcript, St Michael & All Angels (Burtonwood), 1668-1837 "p53 Apr 11 1796 James s. of William & Betty Johnson of Bold, farmer." [S9] BMD Transcript, St Michael & All Angels (Burtonwood), 1668-1837 "p55 May 13 1798 Henry s. of William & Betty Johnson of Bold, farmer." [S9] BMD Transcript, St Michael & All Angels (Burtonwood), 1668-1837 "p61 May 6 1804 Betty d. of William & Betty Johnson of Bold, farmer." [S9] BMD Transcript, St Michael & All Angels (Burtonwood), 1668-1837 "p66 Apr 24 1808 George s. of William & Betty Johnson of Bold, farmer." [S9] BMD Transcript, St Michael & All Angels (Burtonwood), 1668-1837 "p124 Apr 3 1836 Mary Ann d. of Henry & Ellen Johnson of Burtonwood, farmer born 2 Mar 1836." [S9] BMD Transcript, St Michael & All Angels (Burtonwood), 1668-1837 "p122 Jun 23 1835 Betsy d. of Henry & Ellen Johnson of Burtonwood, farmer born 8 Feb 1835." [S1088] Website Lancashire OPC (http://www.lan-opc.org.uk) "21 Jun 1835 Betsy d. of Henry & Ellen Johnson of Burtonwood, farmer 8 Feb 1835."